The The Color Run™ is coming to St. Louis, on September 15, 2013. I am very excited to share a discount to my readers, thanks to my partnership with The Color Run™. I watched as friends and family shared photos from The Color Run™ last year. Each of my loved ones shared their amazing experience, each encouraging me to take part in the next race! So, the time has come, and I will take part this Fall! Join the adventure, as The Color Run™, also known as the Happiest 5k on the Planet will forever change the way you think of a race! Are you up for the challenge? The Color Run™ 5k is on its way to St. Louis, Missouri! The event will take place on September 15th, 2013 in Downtown Poelker/Kaufmann Park! The Color Run™, also known as the Happiest 5k on the Planet, is a unique paint race that celebrates healthiness, happiness, individuality, and giving back to the community. Find out more about The Color Run™ 5k event by clicking here, or check out our FAQ page for answers to commonly asked questions. Join our VIP List to receive updates and notifications about The Color Run™ 5k event in your area. Click here to sign up now! The start window will open at 9:00 am with waves going approximately every few minutes. Start planning out your day! Come early and do some team stretching before the run during our pre-race party! As race day approaches, stay tuned to this page for important information and updates including important pre-race information. Food Outreach is a volunteer-based organization in the metro St. Louis region focused on providing nutritious meals and nutrition counseling to men, women, and children living with HIV/AIDS or cancer. Our 1,900+ clients live in 174 Missouri and Illinois zip codes. Do you want to be part of the event but aren’t able to run in it? Consider volunteering! We always appreciate those who are willing and able to come and help us bring the Happiest 5k on the Planet to your city. Click here to learn more. **Creating a team does not secure spots for all 4 members; each team member needs to register BEFORE registration fills up! For tips on the best way to create a team… click here!! I am so excited to offer my readers a discount at registration Enter COLOR5OFF and you will save $5 off any city that has not all ready sold out! Sign up today, as each city sells out as the day gets closer! See if your city is still open, and register today! Check out the website for lots of information about a city near you. 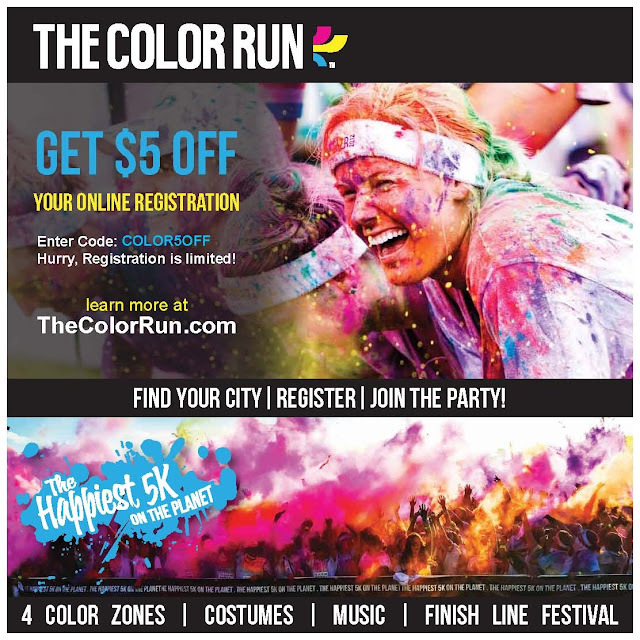 *I was not compensated for this post, but offered registration for The Color Run within my local city. All thoughts and opinions are 100% my own.